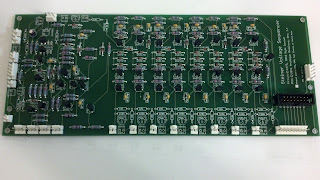 The Sequencer is composed of two PCBs: the logic board, and the output board. The logic board contains all of the clocking mechanism and other logic (number of steps, etc.). The original boards only supported S-Triggers, but the current revision support both S-Triggers and V-Triggers. It is a pretty full-featured sequencer, especially for the time, and has a fair amount in common with the Moog 960 - at least its features are more similar to that than the Buchla and Serge sequencers. There's a lot of features to try and explain, and naming them off here in a couple of paragraphs here isn't going to be too useful. But basically it is an 8x3 sequencer (i.e. 8 stages, 3 rows) with a built-in clock (w/voltage control). Other features include 16-step sequences (from rows 1 & 2), row output attenuators, stage trigger outputs, third row control of timing, and a bunch of other control options (stop/loop, reset, max stages, etc.) David's Synthasystem website has a more detailed overview of the individual controls, and I'll hopefully make a demo that shows them too. I've omitted all of the V-Trigger components - hopefully I got it all right! I was tracing things based on the original schematic, etc. I've used discrete transistors in place of the SSM2210. I've also left off the UJT, which is the core of the oscillator. Once I have it put together, I will test different UJTs and select one with the most appropriate range (there can be a variability in UJTs). 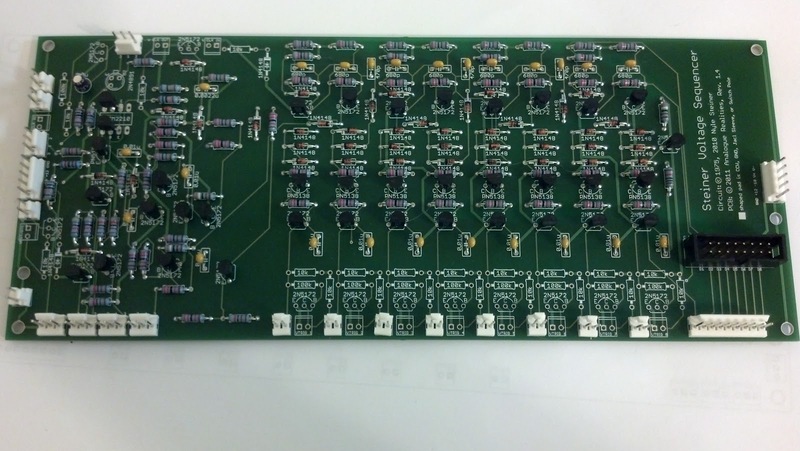 This PCB will be connected to the output board with a ribbon cable (note the 16-pin header).